Please do comment if this game works for you and include your firmware to help other users. It only takes 10 seconds. P.S We recommend Wood r4, better than most firmwares. 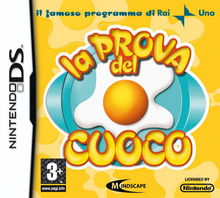 Note: Copy any of the above La Prova del Cuoco (Italy) rom download links and paste it into your browser to download. We do our best to find working Rapidshare, Megaupload, Mediafire, FileFactory or HotFile links. Any Rude comments/fake links will be deleted.